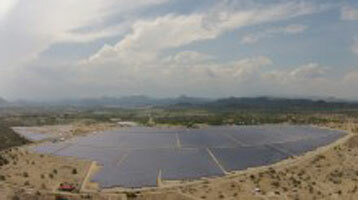 The three companies from Gransolar Group have culminated jobs in record time in Agua Fría Solar Power Project for the client Scatec Solar ASA in Honduras. The group of companies worked together to structure the project optimally and efficiently thanks to the professionalism, experience and commitment that these companies demonstrate in every project they do. And this time, especially highlighting the culmination of this project in record time, considering its far reach. Ingenia Solar Energy (ISE), has carried out the design and the construction Project of the plant, accomplishing the standards required today. responsable for the installation of the SCADA system for monitoring. Gransolar Development and Construction (GRS), carried out the EPC Project (including the purchase and transport of equipment overcoming great obstacles in both fields), completing such work in four months, with a spectacular display of personnel, machinery and equipment. Our commissioning team was responsable for reviewing and implementing the plant satisfactorily. In this project the substation and the evacuation line were outside the scope of our contract with Scatec Solar ASA. The success of this Project represents for Gransolar Group a great satisfaction and boost to continue working and concentrating efforts on current and future projects in the photovoltaic solar energy worldwide market.